The Young Farmers’ Clubs of Ulster is pleased to announce that Chestnutt Animal Feeds Ltd will be once again supporting the VIP reception at the Arts Festival gala evening. The gala evening is on Saturday 7th April at the Millennium Forum, Londonderry. The clubs performing on the evening will be Randalstown YFC, Spa YFC, Kilrea YFC, Kilraughts YFC and Finvoy YFC. Prizes presented at this year’s gala will include most amusing moment, most imaginative theme, best choral piece, best choreography, best newcomer and outstanding performance of the night. 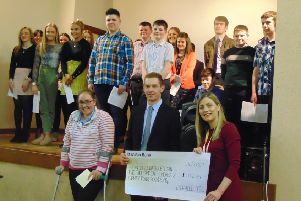 Dungiven YFC were announced winners of the best newcomer at the end of the arts festival week of performances and will receive their prize at the gala evening. Chestnutt Animal Feeds Ltd manufactures and supplies ruminant feed products for distribution throughout Counties Antrim, Londonderry, North Tyrone and the northern tip of Donegal. YFCU president James Speers said: “We are delighted that Chestnutt Feeds has continued its support of our arts festival gala evening.